Artist Anna Harding likes to create delicious, unique designs in cake. I made this cake recently for a friend’s friend’s retirement party. The top layer was lemon with lemon curd filling and fresh squeezed lemon icing. The bottom layer was French vanilla, torted with almond/raspberry filling and topped with almond icing. I used an almond pie filling and added raspberry jam and fresh raspberries. 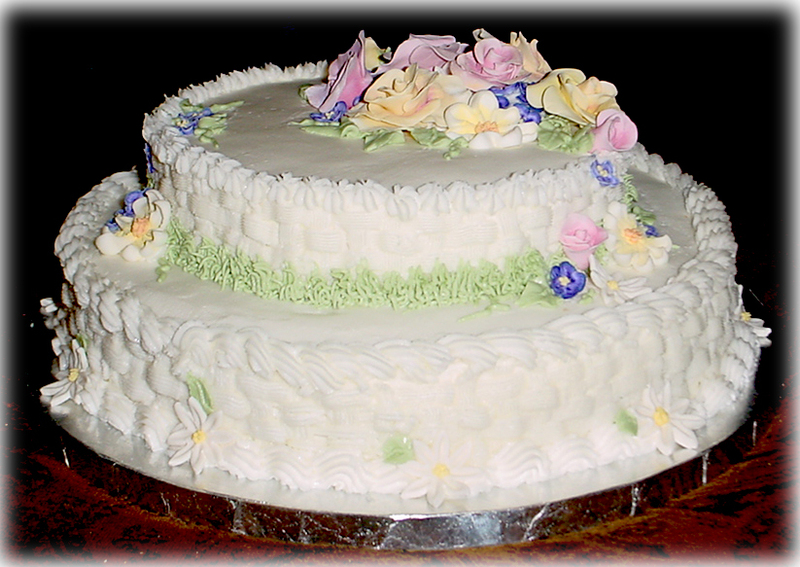 My mom had done cake decorating for years and make the most spectacular cakes. I’d sit at the kitchen table as a child watching her as she made all the flowers, put cakes up on pillars and delicately draped the piping in perfect arches. Her cakes were sought by all her friends for weddings, anniversaries and kids’ birthdays. The girls in my school always wanted to come to my birthday parties for two reasons: to ride the horses and see what my mom would cook up. I usually asked for a princess cake, the kind with the doll in the middle. Naturally I always felt inadequate compared to Mom; sure I could always bake (rule 1: Never follow the recipe exactly! ), Mom taught all the kids in the neighborhood how to bake. I was motivated to take classes because how ugly a cake turned out that I had brought to work one day. I just swirled the canned frosting around and that was that. It tasted great, though, thanks to my mom’s famous chocolate cake recipe. Mom said she had forgotten how to teach cake decorating and she had given away her tips and other accessories to my niece, so I marched off to JoAnn Fabrics, and bought myself the book, bags of stuff and 12 weeks of lessons. The instructors were the best and their work had been featured in the Wilton books and they had made shows for PBS. When I decorated my first cake, the other students said, “Oh, you’ve done this before!” Truth was, I hadn’t. But it turns out that it’s exactly the same hand motions as doing stained glass, who knew? Don’t you just love a transferable skill?